Gift cards are now firmly entrenched as the most popular type of holiday present as well as a go-to gift for most other special occasions. They are also shedding their reputation as an impersonal present, thanks to increased customization and the rise of social gifting. But increased sales and changing consumer perceptions are only the tip of the iceberg as far as the future of the gift card market is concerned. From e-gift cards and mobile applications to the blurring of lines between gift cards and prepaid cards, it's clear the gift card market is in the midst of significant changes. 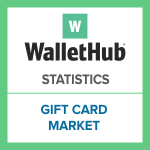 You can use the information and statistics below to learn more about how we got here and where the gift card market is likely to head next. Note: Gift card spillage has declined significantly (81%) since 2009 due to the passage of the Credit CARD Act in May of that year. The CARD Act prohibits gift card funds from expiring for five years from the date of issuance. Wow... kinda bad if you read this.